3) BLS economist Mitra Toossi released some new projections for the participation rate as of January 2012: Labor force projections to 2020: a more slowly growing workforce. 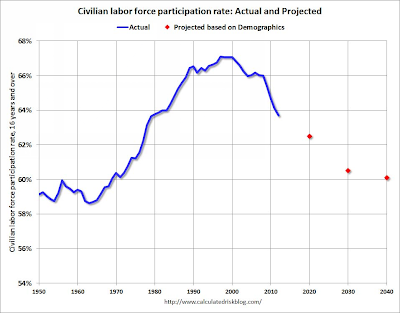 Yes, a decline in the participation rate was expected. My problem with his analysis regards the miss-portrayal of the rate at which the participation rate was scheduled to happen. Calculated Risk posted this chart. The above chart was created in 2012 and does not remotely match demographic projections made earlier. 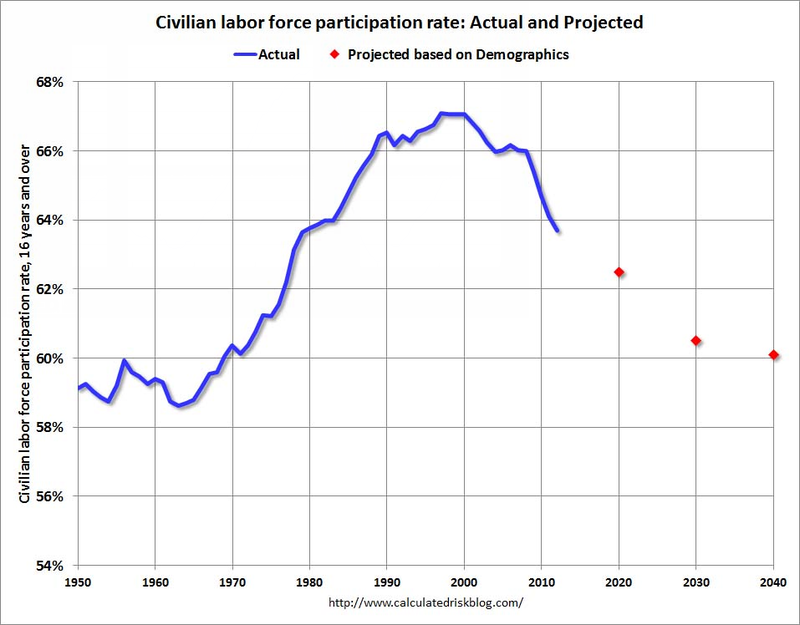 For example, Robert Szafran estimated in September of 2002 the participation rate pattern would look like this. In September 2005 the participation rate was 66.1. In September of 2010, the participation rate was 64.6 which Szafran did not expect until 2015. The current participation rate is 63.6, a number Szafran expected in 2019 perhaps. BLS analysis was much worse even though the BLS had more years of data to consider. Let's take a look at BLS projections made in 2006. Let's look at BLS labor force projections, also from 2006. Numbers in thousands. Taking demographics into consideration, the BLS projected the labor force to grow by 7.19 million to 156.51 million in 2010. The actual labor force in September of 2010 was 153.92 million, a nice fat miss of 2.59 million. Indeed, two years later, the labor force is still only 155.06 million. So, the decline in participation rate was certainly not expected as Calculated Rick states in bold. It only appears that way, based on after-the-fact BLS analysis starting with chart that shows new baseline projections made in January of 2012. By the way, if the current participation rate was 64.6 (the number Szafran expected in 2015, and essentially the the number the BLS originally estimated for 2020), the labor force would be roughly 157.44 million, not 155.06 million. The unemployment rate would be 9.2%. In January 2008 the participation rate was 66.2. It is now 63.6 (a number way lower than Szafran expected for 2015). Conclusion: While the Participation Rate trend is certainly down, and down was expected, most of the decline in participation rate since the start of the recession is due to economic weakness, not demographics.